The USA leads the developed world in motor vehicle fatalities, presenting a critical public health threat. We examined whether an increasing share of mass transit use, relative to vehicle miles traveled on public roads, was associated with reduced motor vehicle fatalities. We used annual city-level data for the USA from 1982–2010 provided by the Fatality Accident Reporting System, the Texas A&M Transportation Institute, the Census Bureau, and the National Oceanic and Atmospheric Administration to estimate a structural equation model of the factors associated with mass transit miles and motor vehicle fatalities. The final analytic data included 2,900 observations from 100 cities over 29 years. After accounting for climate, year, and the economic costs of driving, an increasing share of mass transit miles traveled per capita was associated with reduced motor vehicle fatalities. The costs of congestion to the average commuter and gas prices were positively associated with increasing the share of mass transit miles traveled. The economic costs of driving increased over time, while both the fatality rate and the share of mass transit miles traveled decreased over time. Increasing the share of mass transit miles traveled may be associated with fewer motor vehicle miles traveled. 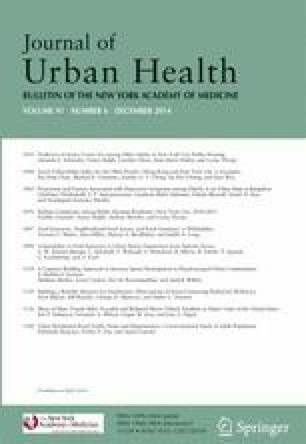 Increasing mass transit uptake may be an effective public health intervention to reduce motor vehicle fatalities in cities. Robert Wood Johnson Foundation’s Public Health Law Research Program partially funded this work. White House. Department of Treasury with the Council of Economic Advisers. An economic analysis of infrastructure investment. October 11, 2010. Available at: http://www.whitehouse.gov/sites/default/files/infrastructure_investment_report.pdf. Accessed February 18, 2014. Smith TW. Trends in National Spending Priorities, 1973–2008. General Social Survey. Chicago, IL: University of Chicago, National Opinion Research Center; 2009. Available at: http://news.uchicago.edu/static/newsengine/pdf/090210.SPEND08.pdf. Accessed February 18, 2014. Bureau of Transportation Statistics. National transportation statistics. US Department of Transportation. Available at: http://www.rita.dot.gov/bts/sites/rita.dot.gov.bts/files/publications/national_transportation_statistics/index.html. Accessed February 18, 2014. Schrank D, Lomax T, Eisele B. 2012 Urban mobility report. Texas Transportation Institute. December 2012. http:// http://mobility.tamu.edu/ums/. Accessed March 21, 2014. US Census Bureau. Current estimates data. Available at: http://www.census.gov/popest/data/index.html. Accessed March 21, 2014. National Oceanic and Atmospheric Administration National Climatic Data Center. U.S. Historical Climatology Network. http://www.ncdc.noaa.gov/oa/climate/research/ushcn/. Accessed March 21, 2014. US Census Bureau. 2000 Census of population and housing. Summary file 3: technical documentation. Available at: http://www.census.gov/prod/cen2000/doc/sf3.pdf. Accessed February 18, 2014. Centers for Disease Control and Prevention. Motor vehicle injuries. Available at: http://www.cdc.gov/WinnableBattles/MotorVehicleInjury/. Accessed February 18, 2014.